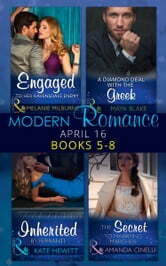 Four phenomenal Modern Romances – international affairs, glamour and seduction guaranteed! Engaged to Her Ravensdale Enemy by Melanie MilburneJasmine Connolly decides to make her ex-fiancé jealous by enlisting the help of her enemy, Jake Ravensdale! But behind their fake relationship tensions build as the line between love and hate increasingly blurs, teetering on the brink of explosion! A Diamond Deal with the Greek by Maya BlakeArabella Daniels would rather skydive naked than agree to Draco Angelis’s outrageous suggestion. But, unbeknownst to Rebel, her father embezzled money from the formidable magnate, and now she must pay back the debt by whatever method Draco demands! Inherited by Ferranti by Kate HewittIt’s been seven years since Sierra Rocci left Marco Ferranti on the eve of their convenient wedding. But now that she’s back in Sicily, Marco needs Sierra’s help with his latest business venture – and he’s determined to claim their wedding night! The Secret to Marrying Marchesi by Amanda CinelliRead all about Italian billionaire Rigo Marchesi’s secret love child with London actress Nicole Duvalle. This bombshell could destroy CEO Rigo’s latest business deal. Unless the rumours that the baby scandal will have a fairy-tale ending are true?